Remember when we said Square Enix was pondering Dragon Quest X for Wii and Wii U? Well it's not true, apparently. AndriaSang has clarified that the two threads of the story — Square Enix is still developing Dragon Quest X and doing technical work on Wii U — are not interwoven at all. The original blog that provided the translation said that the Square Enix is investigating supporting Wii U at launch, though there was no indication from CEO Yoichi Wada that DQX would be a launch game. Thanks to Zaphod for the tip. Good, just keep it on Wii. I don't want a superior version on another platform (even though i'm getting wii u as soon as it launches). Iwata ha come on now show us hope with a smile. Makes sense. DQ 8 didn't move to PS3, DQM: Joker 2 didn't move to 3DS. Wii has an installed base of almost 90 million. SE has no idea how well the Wii U will sell. Just because they are not working on a launch title for the Wii U doesn't mean DQX won't be released on the Wii U though does it? Or is there more to the story than what is mentioned above. I see nothing in the body of this news article on Nintendo Life saying "Square Enix is Not Considering Dragon Quest X for Wii U"
Well, yesterday we said they are, today we're saying they're not. I figure we've got all bases covered now! I've already explained this in the forums - a Dragon Quest game can't launch a console. Square Enix needs to shift bucketloads of the game because sales expectations will be huge, and no launch could have enough consoles in consumer's hands to meet those sales expectations. Dragon Quest games are released for the most popular console in an era, with the biggest install base. That way the number of potential sales is at its maximum. Yeah, I can understand the reasoning behind that Waltz but it is still really disappointing. I would have loved to play an upgraded version of this game on the Wii U. I love Dragon Quest and I will still be picking this game up as long as it is still coming to the Wii. Honestly, I think that I would rather Square Enix bring this game to multiple platforms like the PS3 and Xbox 360 since it is no longer coming to the Wii U. Oh well, hopefully there will be a Dragon Quest game on the Wii U sometime in the future, probably distant future. When I heard it might be released on the Wii U I thought it might be even longer before we see it. I just wish there was more info though, please tell me they're going back to random encounters like in dragon quest 8. It's just not as terrifying when your party is half dead and you can see the monster to run away. 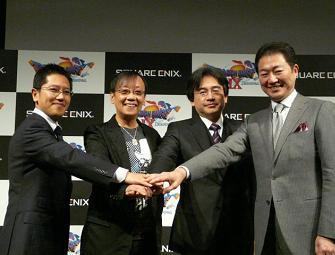 Here's a thought Square-Enix; why not just release it on Wii U AND PS3 AND Xbox360? What's the point of limiting this game to just one console anyway and with the afformentioned systems being so close in architecture, there is no reason not to. It would cover that large range of people you want to sell your game to, give them a choice as to which version would suit them best and also pontentially help build Wii Us userbase in it's initial years on the market. Sure, the game will break records even if sold on the original Wii, but only in Japan. If you really expect worldwide success of this title, you have to get it on as many CURRENT systems as possible. Because, knowing the other two, they may throw money to get exclusives and then there will be petty arguements over which is better. Even today, people aregue about multiplatform games (mind you, they are all the same). It's not the reason, but hey, people keep talking about Wii not having exclusives (which is ignorant to say), this just adds to it and frankly, I love DQ. I'm glad it's coming to the Wii and not the other consoles as them others have FFXIII and then some. As for DQXI, might as well release it across all platforms. I really don't care if DQ X is for the Wii U, I just want it to come out dammit, I would be nice to play that game on my Wii, considering there are only a few games to look forward to on the Wii for me. I am not sure if I will get this game it depends how much motion control is in it I don't like my RPGs with alot of motion control execpt for Zelda. Like how Miyamoto was never at work adding motion controls to Twilight Princess? Wow, guys you realize they have been working on this game since 2005? They were not sure about the online thing but now its confirmed. Not hating but, this game is EXTREMELY detailed or it was huge waste of time for square enix making this for 6 years.